Chelsea Ladies will take a slender lead into the second leg of their Champions League last 32 tie with Glasgow City after winning on their European debut. The newly crowned Women's Super League champions took the lead when Fran Kirby skipped past her marker and hit a sweet strike from the edge of the area. The visitors' best chance fell to Kelly Montgomery just after the break, but she volleyed over the bar. Glasgow keeper Lee Alexander also saved well from Millie Bright and Ana Borges. 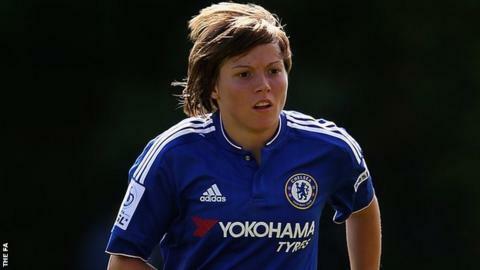 England striker Kirby had netted twice in the 4-0 win over Sunderland that sealed Chelsea's first league title on Sunday, and proved to be their matchwinner again with her 39th-minute effort. Glasgow, who reached the quarter-finals of the competition last season, struggled to create chances but were left to rue Montgomery's miss. The lively Kirby shot wide after escaping from a crowd of defenders as Chelsea pushed for a second, and after denying Bright and substitute Borges, Alexander did well late on to hold another rising strike from Kirby, giving the Scottish league champions hope for next Wednesday's second leg in Glasgow. "To win 1-0 at home with a clean sheet, for the first time (in Europe) in Chelsea's history, we have to savour these moments. "Overall it was a good performance. "If it wasn't for their goalkeeper, we'd be talking about at least a two-goal lead tonight." "I thought we were excellent. We came here to do a certain job and I couldn't have asked any more of my players. "We came up against some of the best players in the world. We more than matched them at times. "We were undone by a moment of brilliance from Kirby. I'm looking forward to the away leg, because we're still in this."